We can't give you a quote from Move2ucargos Ltd , but we have hundreds of drivers waiting to offer you a great price. 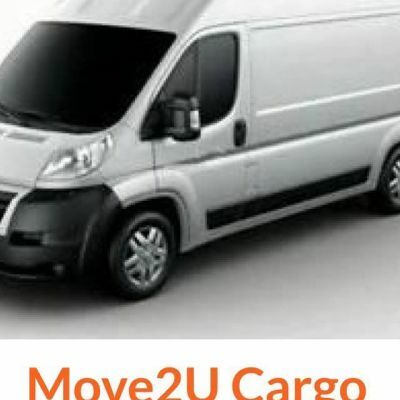 Have a question for Move2ucargos Ltd ? No problem, send them a message and they'll email you back as soon as possible. If you have a more general question you might find it answered in the FAQ, or you always contact one of our brilliant customer service team. * Move2ucargos Ltd won't be able to see your email address. Please book for a great reliable service. Tony was the best moving man we've ever had. He got on with the job and we were done within two hours (we only moved around the corner). Would definitely book our move with Tony again. Great team, would highly recommend. I would like to highlight that when I made the booking I booked for a small van with 1 person help. The driver arrived and after loading the stuff informed me it's the large van and after telling him that we ordered a small one he asked us to pay extra 20 pounds. Upon reaching the destination the driver/helper refused to unload and place the items in the apartment and said we hadn't paid for the service when in fact we did pay for help as was clear on the booking confirmation. In the van along with he driver my uncle went to the destination. My uncle has back problem and can't lift heavy items and because of this driver was forced to move the items. I can easily sue given the circumstances and negligence. I had heard good reviews of man and van and hence booked the service but I am very unhappy and dissatisfied with the service provided today. Also, I would like to highlight that the driver allowed his kid to sit in the back of the van during the move without any ventilation- that's a clear violation of terms. Additionally on reaching the destination he found a couple moving out of an accommodation and started helping them and asked them to pay 30 pounds and left my uncle to do his job of offloading. I will be lodging a complaint and would like immediate action to be taken. CMV response: The driver totally disputes this review. The charge for a large van was levied as the customer's goods exceeded what a small van could carry. The driver is fully aware that to carry any passenger in the back of the van is illegal. However, the customer has been fully refunded due to her extreme dissatisfaction. Tony was very fast and efficient. We got the job done in a lot less time than we anticipated. Tony was a GREAT driver! He was on-time (early in fact which was great), very pleasant to work with, and helped me have a quick and easy move. I can highly recommend him! Good service. I will be happy use again or recommend to others. Tony was great, friendly, really helpful and kind. Took a detour to put a table in a front garden en route too. Everything was great and when we need help moving again we'll contact him for sure! Tony was brilliant! He was so helpful and hard-working. There was a lot of stuff to move, it was very hot and the traffic was awful but he remained calm andgood natured throughout. I would recommend him very highly. Great service - friendly, quick and well worth the money. Tony was Brilliant, poor guy was sick as hell, but sucked it up and smashed the move out, proactively avoided roads with ramps too on route to the new place, we pretty much got the main move done in 2 out of the 4 hours I had booked. I asked if we could do a separate return trip elsewhere to pick up a sofa and that wasn't an issue either. Whole thing done within the 4 hours allocation. Very impressed mate well done, I'm not sure if he had to cancel any bookings after mine to go back to bed due to being ill, so if there is any bad reviews from that you need to consider this review also. Brilliant driver, extremely helpful- Made our move as stress free as possible. I would highly recommend! I was hugely impressed by the service provided. It was fantastic value for money and the driver was absolutely brilliant, efficient and friendly. Will be recommending to everyone I know who has a move coming up. Thanks! Tony and his helper were great. Friendly, prompt, and did everything we needed. Would definitely use again. This has been a really good experience. Quick, efficient and professional, yet up for some joking around on the drive over. Have already recommended Tony to a couple people! Would recommend. Tony did a good job. By the way, he seemed to be in a hurry. Its like he wants to finish the job as quickly as possible and then move on. If you have everything already packed and all he needs is to move them, then that pace ia fine, otherwise it can be a pain when you are packing stuff as he is moving. Also, even though I went over by 10 mins, I had to pay for the full half-hour. Professional service, stress free move! The two guys were great. Showed up early, were efficient, polite and friendly. Would recommend them any time. Tony was amazing and soooo quick! I couldnt recomend him enough! Thanks tony! Great team. Both very nice and helpful! Would recommend and use again. Absolutely outstanding. Couldn't recommend more highly. The driver was extremely friendly & efficient. The whole service was very quick. However, we would have preferred more time & care as some of our furniture was scratched. Really pleased. Helpful and friendly guys. Very fast. Seamless. Tony and his young helper were quick and efficient. The move was done in the 2 hours we had booked them for. It wasn't until after he left I started to notice more and more scuffs on corners of things etc. Good service but even though I wrapped everything I suppose it needed wrapping better. Quick and efficient. Tony and his helper both were great and very efficient.They moved the stuff so quickly and with care.I will definitely recommend them , keep up the good work. Tony was helpful, quick and efficient but careful with my items. He was understanding and helpful and I'd recommend him to anyone wanting to move house hassle-free. Perfect moving experience. 5 stars! Fantastic service. Driver was helpful and friendly. Would definitely recommend this service again. Tony was very professional and extremely helpful. He made the move so quick and efficient, I couldn't have been more happy with the service and great value. Will definitely recommend to friends and anyone else looking for a great man with a van! My driver was not just on time, he was early. He was really efficient and friendly. I would 100% recommend him to anyone else moving. We managed to pack/unpack and drive from South London to North in bang on two hours (which was a pretty mean feat). Very happy with my service. The quickest move ever. Really great service. Driver was prompt, extremely friendly and polite, and very efficient. Booking and paying were both really easy. Would definitely recommend to others. Second time we've used Tony and he was just as great this time as the first. Really hard working, friendly and gets the job done! Highly recommended. Tony was extremely friendly , helpful and so efficient - would recommend him to anyone ! Great job done ! Tony is a very nice Driver ? 5 stars service ? Courteous, respectful, efficient and really friendly. Will definitely book again and would definitely recommend. Tony Cargo. Very prompt, very serious, honest guy ... I had a very good experience working with him. This is what I call moving. Fabulous job 5*****. Really helpful, quick and hard working, highly recommended. Tony arrived early which was great, and really quick at packing all our stuff up and dropping it off. Thanks! Friendly, helpful, fast - highly recommend Tony. Great service. Very helpful and very efficient. Would definitely recommend.